Retelling mythology from one’s own perspective is in-thing in the literary world of India now. However, it is not that earlier there was no mythology retelling done. Actually, after analyzing the course you can understand that retelling mythology was always there in Indian (that is Bharatiya) culture. The original Ramayan was written by sage Valmiki but the present and most popular version of the same was written by Tulsidas. And in fact, there are various versions of Ramayan are found in various areas of the countries. Some of them have quite a different perspective. The famous Indian author Amish Tripathi who writes in the same zone mentioned it in many of his speeches. And, it is not only Ramayan, you can find the same happen with Mahabharat also. You can find a temple of Duryodhan in India, who is rather the main antagonist in the Ved Vyas’ Mahabharat. It is interesting to know that, actually, that temple ignited the need to look the tale from a different perspective for author Anand Neelakantan and result in his Ajaya series and Asura Book. Author Devdutt Pattanaik comes with books like “My Geeta” and “My Hanuman Chalisa”, clearly indicating they are not the absolute retelling but altered with author’s views and vision. And, not to forget, now decreasing at a worrying speed, the tradition of hearing moral, ethical and mythological tales from grandparents always fascinated children in India for generations. And, they would have been changed to suit the mood, age, and nature of the listener. A lot of kids are grown up reading Amar Chitra Katha, which is once again adaptation of mythological (and historical) tales for specific readers. 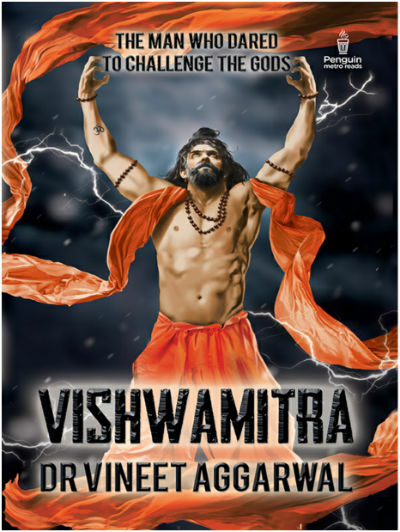 Recently, we came across a book on Vishwamitra by (now) famous author Dr. Vineet Aggarwal. Considering that the book will explore the tale of Sage Vishwamitra from his perspective, I decided to give it a shot from our team, and I found the book quite interesting. Let me share my views on this book. No matter how many times it is said that “never judge a book by its cover” or the fact that the saying is correct, it is human nature that most of us choose the book by its cover. Of course, there is book blurb and nowadays you can also find a couple of chapters free to read, so it is not going to be a blind decision just based on the book cover. However, just tell me the truth, you might have experienced that a good cover page makes you go further to read the blurb or other content of the book. Then some smart readers go for book reviews also. Again not all the reviews are unbiased and unpaid, but then also they give you a fair idea about the book. The cover page of this book is quite interesting. The right mixture of red, saffron, white and black color showing the chiseled body of Vishwamitra (via illustration, of course) makes the reader give it a second look and you will realize that it is detailed. A good cover page, indeed. The story of Vishwamitra is known to the majority of readers who grew up in a middle-class family environment where listening to such bedtime stories is a habit. Of course, due to Ramayana you must have some hint about the character of Sage Vishwamitra, otherwise also. And yes, people often remember the tale for the Menaka episode. There was even a Hindi TV Serial aired on Doordarshan titled Vishwamitra, where Mukesh Khanna played the protagonist. Don’t worry if the tale is known to you, half-known to you or unknown to you. The book starts from very ancient time. Much before Vishwamitra or even his parents time to give the background information. Because, each event happen now will affect the future anyway, and the present is thus a result of what happened in past. We got to know about sage Ruchik who came to king Kadhi with a proposal to marry his only child, Satyavati. Ruchik didn’t want to engage himself in this material world and domestic life, but his father Sage Chyavan’s order cannot be offended by him, as an obedient son. Being the only child to Kadhi, Satyavati was to be the next ruler of the kingdom of Mahodayapur, and if she will get married to a sage, she is going to live with him in the Jungle, who will then take care of the kingdom and the citizens? Ruchik came up with a genius solution. By utilizing his knowledge of herbs, science, and spiritual powers, he prepares two pots having a mixture within to drink at a specific time, one for each, Satyavati and her mother Ratna. They both are eventually going to conceive baby boys solving the problem. The son of Ratna will become the heir of Kadhi and will administer the kingdom and son of Satyavati and Ruchik will we a sage and eventually an advisor to his maternal uncle. By knowing the plan, Ratna thought, whenever someone prepares more than one stuff, usually, he/she keeps the best for himself/herself. She considered that Ruchik must have thought better of his own (to be) son then his (to be) brother-in-law! And, actually, a better person needs to be a king. So she insisted her daughter to change the pots before drinking the potion! The human nature!!! Unknowingly the swapping of pots changes the fate of both the boys, clans and the mankind to an extent! The boys grew up to be Yamadagni (aka Jamadagni, whose son ParashuRaam aka Raam is considered as an avatar of Vishnu) and Vishwarath. How will Ruchik react when he know the fact? How Vishwarath and Yamadagni will grow and what they will become in life? What will make Vishwarath, VishwaMitra? Well, you need to read the book to know more :). Retelling mythology is not an easy task. Not only that the story you are going to tell is already known but also the fact that there are so many books in this genre area flooding in the market. So you can survive only if you have something unique to offer. Ancients of Greater Bharat by Col. Mohan Vizakat. While you can see the infusion of science in the mythology in this book at many places, the grand plan at the climax has it in a reasonable amount. The other thing I like in the book is the characters. Nobody is perfect and no matter who one is, his/her karma and destiny play a vital role in deciding his/her course of actions. While Devas are worshiped in the society and one consider them perfect and or the life in the Swarg (heaven) is perfect; the ancient scriptures talk about the non-positive things about Devas as well. The author makes the character more real by showing both positive and negative sides of the same. The way, at the beginning of the book he explores the story by declaring lineages, we got to know that author did a remarkable research and the story is going be written in such a manner that you will be able to connect the dots. I also like the way King Kadhi used to tell a bedtime story to Satyavati. One more thing I admire about the book is the way the author handled the “Menaka’s seduction” chapter of VishwaMitra’s life. It is possible one of the tough things to write about. Many few know that it was not just an incident, they remained together as a couple for around 10 years! The author could have taken the liberty to add adult content, which is seen these days in many books, but he is in complete control here. While there are so many pseudo feminists there around us and some of them are even writing books and adding anything in the name of feminism, this book has clearly shown what the gender equality is. Not only the character of Satyavati, but even the character of Menaka is strong. So the author had given the characters chance to grow in their unique individuality showing their limitations as well as strengths. He likes to live life on his own terms and did not fancy a woman changing his lifestyle and if rumors were to be believed, they had a tendency to change a lot of things!! Truly there’s no better happiness than getting the right partner in life! … was too engrossed in my own reluctance to begin a householder’s life to pay attention to what my prospective bride may have in her mind. I cannot undo the past but I can strive to give you a bright future. Civilization could only thrive if people rose above their individual greed and thought about society as a whole. Yet, it was so easy for mankind to return to its barbaric roots and destroy in a day what was built over decades. Perhaps the love of one’s own family and people is motive enough for one to commit a crime, however petty it may seem to some. All were allowed admission, since the kingdom trusted its citizens and the need to provide security from the populace was never even considered. Remember, kingship does not imply lordship over your subjects, it implies hard work and tough decision-making, sometimes even at the cost of your personal happiness. Running a kingdom requires as much showmanship as real capabilities. For a king might make an error of judgment but his advisers can’t afford to be wrong ever. After all, there is a limit to one’s physical capacity but none to the powers of the mind. After all, a man’s actions make him what he is, not his thoughts. Their guru had changed not only their external forms but also caused a transformation within their hearts. Their eyes were full of dreams and they both hoped reality would be as beautiful as they had imagined all these years. It does take a lifetime of experience to be able to find a way that is beneficial to a majority for someone will end up losing no matter what you do. One could become a true renunciate only after discharging all one’s responsibilities towards this world. However much importance one gives to free will, in the end, he cannot escape the hand of destiny. Little did he realize that life has a way of turning things upside down and changing the proverbial lock just when it seems you have figured out the key to it. The way the land is referred as Nabhivarsh is interesting. I am sure you will enjoy the scenes where both the students are asked about a tricky situation and how the answers reveal their characters. Also, you will surely like to read the Guru’s answer to such situation. Be it the sports match or the war, the author puts the thing together pretty nicely. You will find the explanation of surrounding written nicely in the book. In addition to be a good writer, one needs to travel the places and imagine the situations and locations effectively for that. And, the book doesn’t disappoint you in that. The pace of the book remains almost flawless throughout and you will surely enjoy it. I consider the book as mythological, as well as inspirational read and I, can sum up it by referring a statement from the book. Man’s ultimate destiny was to become the master of his own destiny. Of course, there are some let downs in the book as well. I read the kindle version of the book and found that some of the sentences are not coming smoothly. Some of they are breaking improperly and some of them are (possibly auto-corrected) having different words than you expect. Here is one such sentence. All right, so Jahnu refused Ganga’s wedding proposal on the grounds that he had become an ascetic but Ganga was tumultuous and wont to have her own way. The epilogue comes after the author note, and thus it breaks the flow. It should be otherwise. Well, telling more than this will spill the beans about the content of the book in a way that it will be a spoiler and as you know, we at ThinkerViews, like to provide spoiler-free reviews. If you love mythology, you will love reading this book. It has more positives then let downs. I will definitely give it 8.5 stars out of 5.